Welcome back, Doni! You know, I had not even noticed that we have gotten near the 300 post limit! Wow! It is a little mile post, is it not?! We do tend to be quite monotonous in our alliance-choice here ! The proposed title is great in my mind. "Sometimes I think I'll never fall in love, I require so much!" There can be no doubt that I so much agree that Jenny's Glorfy is so much better than the creepy-ish one of the card game. "Are they for real?" was always my thought when I saw that, though in a twisted way it might make sense movie-wise - from that Glorfindel, Arwen would have been quite anble to steal Asfaloth ! I Finrod! SWOOOOOOOOOOONS for Jenny! Ooh, I saw that one yesterday and was swooning hard, I prefer that Finrod to her earlier ones. Finrod really is swoonworthy - both the elf and the picture! 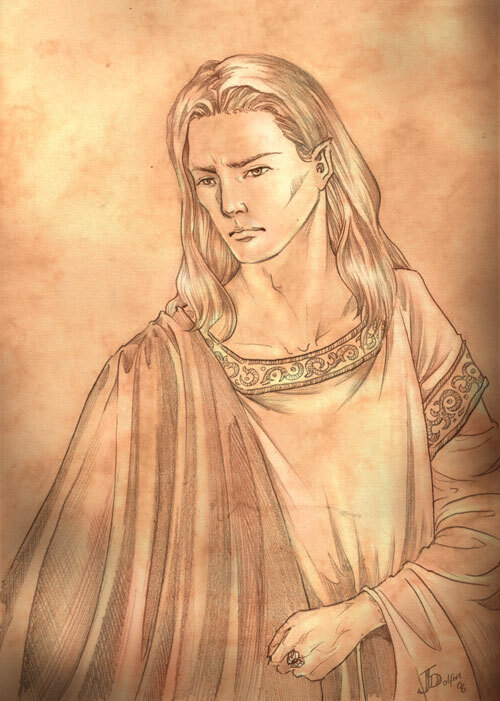 As much as I love Fëanor and his sons, even the troublemakers, I will gladly admit that Finrod was the most noble of the Noldorin lords of Beleriand. I agree - a Fėanorean is someone to fall madly in love with but you would want to marry someone like Finrod ! As if we get the chance but still...theoretically it would be so . Whoops! Haven't been here for a couple of weeks, and two new Jenny Dolfen pictures are up! I don't even want to start on the Glorfindel thing..but that picture sort of resonates with how I see him! And Ecthelion! Finrod is wonderful! I agree with rowanberry that he was the most noble of the Noldorin lords in Beleriand! Aurelin..I love that kinslayer pic in your signiture! We had a LotR weekend just gone, and my husband picked up a sword for the first time! He is good with a bow...but the sword sort of does something....I think I will fall in love with him again! But I will sw n for Ecthelion..because he gets ignored a lot of the time, and I like him! He is good with a bow...but the sword sort of does something....I think I will fall in love with him again! How :love!!! Especially considering it was Valentines Day yesterday! Thank you, I adore that Kinslayer pic to no end! Speaking of the ignoring Ecthelion gets, I really like the way you put him into your story and keep him in it - as such a lord of the Elves to slay a Balrog, he had to have been most influential and highly regarded. Swooooooonn for Ulmo because I love soft snowfalls! I would love to learn archery, and to use a sword in competition..foil, rather than broadsword! But the LotR type swords have something about them. My husband did archery from his youth, and used to win a lot of chocolate! But when he picked up that sword on Saturday, he transformed before my eyes! Not that he is in any way violent, but I shall be keeping an eye on him! The rush to take up archery has died down a bit now, and I might see if I can take some lessons this summer! Do I get another swoon??? Then it has to be for Glorfindel, to keep a nice balance between the Captains of Gondolin! I'd swoon for the whole Fall of Gondolin cast! I have said it before and i thnik most Tolkien fans are in like mind - if only he had gotten a new version of it to paper to take up all the alterations because we have missed out on a wonderful thing. The same goes to the fall of Doriath. I've missed the chance for a one time practice run twice because a friend who was the one who at first spoke of it, could not go and I did not know the others who went. Not that he is in any way violent, but I shall be keeping an eye on him! I guess the ages past will come to live before your eyes then - give a sword to a man and he can surprise you immensely! Hi, ladies! It's Friday, and if there were a Vala of Friday, he/she would most definitely get my swoon. I do own a bow, but it's not a recurve bow. It's what I believe is called a compound bow; anyway, it has several wheels and gears on it to lessen the draw-weight. I don't shoot it much, though. And I have to say that I prefer recurve bows. I got to shoot my friend's longbow once. That was a beautiful bow--such a pleasure to use. Someday, I am going to break down and buy myself a sword. I don't have any notion of how to use one, I just want to own one. Speaking of swords and bows and men who use them, I was remembering my comment earlier on this thread. Doni wrote: My current list of attributes that I'm looking for in a guy include being a Christian, a gentleman, cloak-wearing, sword-toting, oh, and if he happens to look cute with longish hair, that wouldn't hurt, either! Actually, those last three conditions aren't strictly necessary, but they'd be nice! Guys like that do exist. I met a fellow this semester who fits that criteria. He also is a LotR fan (well, he'd almost have to be to meet some of my strange requirements). He doesn't actually have the cloak (I'm not sure about the swords), but he'd definitely be willing to use them. He told me he wants to build himself a set of Gondorian armor--specifically, Gondorian of Dol Amroth. Don't get me wrong; I'm not pursuing any romantic relationships at this point in my life, but it's encouraging to know that such guys as I would be interested in can be found. Well, I should be off to my homework. Since it's been a while for me, a great SW :Q:Q:Q:Q:Q:Q:Q:Q:Q:Q:QN for Maedhros Nelyafinwë! P.S. Aurelin, have you been making any Inverloch proselites? Poor Varden...I think he's had his feelings hurt in the last pages of the most recent chapter. But I'm sure Lei'ella will come around eventually. Hello! How fun to see you over here again, Doni! I don't have any notion of how to use one, I just want to own one. Hehee, and I was almost sure that you did not have guys like that around ! I like the taste of Gondorians of that guy you spoke of Doni! I am still sad they had to leave out the Knights of Dol Amroth from the movie. Most certainly Maglor would have been quite a "normal" choice for a husband since in my mind the Oath plus the kinslayings were so unlike him that he would have been quite as good a husband as say Fingon otherwise. You caught me! There was that one Feanorean I had in mind, true! Of myself I would not be that sure! But who knows!? Lest my threat lose any of it's power, for RP purposes, it is assumed that all ME alter-egos are adept at weaponry, regardless of the skill (or lack thereof) of their unfortunate half who happens to be stuck in that thing called Real Life. Ahem. Sorry, my Fëanorean side was coming out for a moment there. One of my good friends also really likes the Dol Amrothians. So, I was pretty amused when Seth told me he liked them, too. Today's SW :):):):):):):)N is for Voronwë because he's a mariner and has a wonderful name. I stand with the assumption too, otherwise the confrontation would look most silly, would it not?! My Fėanorean side is there most of the time. It is either the red hair or just the temper but I do feel (and would have been mortified at the thought a year ago) that I am most like that bunch! Oh fun! Some long lost cousin or something ! There is something so noble and likeable about the Knights that you cannot help but notice, remember and grow very fond of them. Heh, my Fëanorian side has mostly to do with my pride, and my very very strong opinions that I have a hard time concealing or softening. *sigh* I'm in need of reform. God's working on me, but we're making slow progress. You know, I was wondering, other than Maedhros and Maglor, would you really want to be madly in love with any of the Sons? Celegorm and Curufin, you'd have to be more than a bit mad to be attracted to. Caranthir, you could probably find attractive. And the twins, I suppose. What do you think? SW N for Lorien because I am about to go to bed and catch up on some much-needed sleep. Other than the two eldest - the twins for sure, the Troublemakers would be too much! Somehow Carantir has more or less left me uninterested but then there is not much of him and what i do recall sharply is positive - the Haleth matter. Yeah, guilty of pride and a black-or-white worldview too! Oh boy, we are Fėanoreans! SW NNN!!! for Caranthir, because as I said, I have been too cold towards him. Well, I wouldn't say that a black-or-white worldview is the problem. I believe in absolutes. I just tend to get way too overbearing about things. Even stupid little things like the fact that I think herbal tea is an abomination. SW :D:D:D:D:D:D:DN for Varda because I love the stars. Why did I suddenly get the idea that Valian hates herbal teas as well?! Or am I just being plain evil and wish to see a somewhat comic scene of Llyn putting herbs in Valian's tea and the latter's dismay and outrage! SW NNN!!! for the firstborn of Fėanor, that's quite the constant state for me . You really have it in for poor Val, don't you? No, I don't have anything like that in mind. Well, today my Fëanorian side was manifesting itself in making relations between me and my roommate a little tense while we were talking about Tolkien vs. Shakespeare. Speaking of tea, I think it's time for me to brew up a cup of peach flavoured black tea and sit down with some homework. SW N for Túrin Turambar because I feel somewhat cranky and perverse today. Well, tea in your world does not have to be the tea in ours, therefore the growing areal of it does not have to be the same either ! So when speaking of latitudes and longitudes of two made-up worlds and the main areas of events - yours is close to Tolkien's as I gather, right?! I have a dislike of Shakespeare as well. In addition to the "grievances" JRR had concerning the "great poet", for me there is also the matter of Richard III whom the Tudor pet Shakespeare wrote into a monster while I have read quite a few book that deal with his matter and show him from a positive side and Henry the VIIth as the brilliant but vicious and unpleasant king. Aah, I hate sneezing and that is most of what I have done for 2 days! Fėanor take this runny nose! Do I detect an insult? Now that will bring out my Fëanorian side! Another red-head here! But I am totally with you regarding Shakespeare. I particularly dislike his vastly inaccurate portrayal of Richard III, and of Macbeth! History is usually written by the victor, or, as you say, the victor's pet. Sorry to hear you have a cold, Aurelin. Hi, Doni! Umm, peach flavoured black tea! Though I prefer Earl Grey. Reading back a few posts, I am glad to hear that you met someone who fits the ..cloak wearing, sword-toting, cute, longish-haired Christian specification. Hard to find, but certainly not impossible! Sorry, I didn't express myself very well. I do like Shakespeare very much. His use of language is stunning, both in beauty and in wit. His understanding of human nature is astounding, as well. I believe he truly was a genius, and though I may get killed for saying such a thing here on a Tolkien board, I believe his genius was greater than Tolkien's. However, Tolkien is my first love. So, while I am in awe of Shakespeare, I am in love with Tolkien. On the other hand, Shakespeare is my roommate's first love. We don't really disaggree on the greatness of Shakespeare, but things were getting just a tad tense there when I was professing a greater love of the Professor than for the Bard. Yes, the geography of my world (I guess it needs a name now) is similar to that of ME in that it is a northern hemisphere, temperate zone. Oh the horror! Remember the guy I mentioned who looks like Jenny's Maglor? He completely shaved off his beautiful Elven tresses! Why? SW :D:D:D:D:D:D:D:DN for Glorfindel because I'd like to have his aid sometime in battling the dread balrogs of homework! No, no, don't delete anything, Aranis - quite the "right" swoon! Do I detect an insult? :innocent smile: Nope, but he is a good guy to set on bad things, eh?! All red-heads seem to turn to Fėanorean-ism! I'm not complaining, do not misunderstand me. Thanks, I am feeling a bit better by the end of today, mainly due to the nose that stopped acting like a tap! One of my colleagues that is an English language student did tell me how she did not think a lot of Shakespeare either before she had to study the language use thorougly and then only came to undestand why he is so revered but yeah, I still remain sceptical! I could not get further than 20 pages or so of Romeo and Juliet because it was so boring! Hamlet was on the reading list at school and Midsummer Night's Dream I read to see for myself what he had done to elves! He completely shaved off his beautiful Elven tresses! Why? Perhaps he first got his hair cut off by Orcs and after he escaped from dangling from his wrist for years on a high mountain, he decided that to keep himself from never forgetting his oaths he shaved the hair off completely!? Or am I mixing him up with someone else ? SW :):):):):):):):):):) NNN!!! for Elros because of the choice he made and what ironically and tragically for Elrond his niece chose as well. Actually, Shakespeare didn't do anything horrible to Elves. It was Tolkien who appropriated the name for a race completely unlike those in folklore. He chose a beautiful name for a beautiful race, but it is unfortunate (as I believe Tolkien himself has noted) that because of it they are associated with the vastly different creatures of traditional folklore. SW N for the red-haired Elf who seems to be the one major exception to my preference of long-haired elves. Well, no English expert I am but in my mind those things in Shakespeare's works are still mostly called fairies and I was under the impression the the English name for the Tuatha De Danaan was aside from Fair Folk (E)elves as well but let's face it - you are so defencive of the Tudor pet (=:) ) and I am so prejudiced against him as mentioned not only due to the elves and Macbeth thing that relates to Tolkien that we are getting nowhere with this. Like true Fėanoreans - our minds are not swayed easily from the standingpoint we have taken! But that is all right with me! SW NNN!! for Varda of the Stars! Compliments to the talented Catherine Karina Chmiel! The "flower fairies" do begin with Shakespear, I think. He set the tone for the whimsical creatures of the next few hundred years. Tolkien returned (with a vengance!) to the Elves of myth and (older) folklore. We cannot blame Shakespeare entirely, of course - there were other factors that went into the popularity of "pretty" elves. But he was a contributing factor, for sure. But I think the main reason that someone like Shakespeare could never get my love is that he is too bitingly satirical. He pokes fun of everyone, and has a rather jaded outlook. I like his tragedies best, because then (at least) he does not laugh at them as they fall. Of the ones I've read, Hamlet is my favorite - it's also the longest. I have seen the second pic but not the first. A (tiny ) SWOOOOOOOOOONNN!!! indeed. I have always wished to read Shakespeare's historical plays but never gotten round to it and I am not that exstatic over him anyway so I probably never will. I might not be a play person either so that is another factor of being sceptical of him all together. Yes, i recall JRR's remarks about Shakespeare as well and how the plays were better to see than to read it in one instance I have felt the same - Richard the IIIrd was stunning on the stage but I did not get the feeling when thumbing through the play. We're in need of a new thread in 6 posts! The title Doni proposed a while ago (like "Silmarillion Swooning and/or The Sons of Fëanor Fanclub") sounds lovely to me. Aurelin!! Tsk, tsk, tsk. You're back to laughing at Varden's hair. *fingers sword hilt* How dreadful. Mithluin, I don't believe Shakespeare truly has a jaded outlook on life. It may seem so at first glance, but I don't think that's the final word on the matter. Unfortunately, I can't give you any examples off the top of my head. I like the idea of the Sons of Fëanor Fanclub title. If we're going to use both that and Silmarillion Swooning in the title, I think the Fëanor bit should come first since that seems to be our primary focus. SW :Q:Q:Q:Q:Q:Q:Q:Q:Q:Q:QN for Maedhros today because I'm reading a book in which the main character loses his hand. I'd started the book over Christmas break, but got mad about that certain developement and so put the book down. I'm reading (and finishing) the book over spring break this week. Well, agreed - he was not as jaded as, say, Mark Twain I will just say that Tolkien is 'less-jaded' and we can be in agreement . Oh, and I forgot to mention...I do have a sword. It's not my fault, though! Rune made me buy it! It's a second-rate version of Glamdring, but it looks pretty on my wall....hehe, and will look even nicer once I put up Jenny Dolfen's Finrod! I think a Feanorean title would be lovely, so long as we can still swoon for Finrod (and others) here. You know, if we find a connection....Finrod is their cousin, after all.... Beren and Luthien ran afoul of the troublemakers.... etc. Oh, non-Fëanorian swooning will still be allowed, and encouraged. I was thinking of nameing the thread "The Sons of Fëanor Fanclub and Other Silmarillion Swooning." MithLuin, I think it's cool that you have an original Dolfen artwork for your wall. So, is Finrod your favourite elf? I don't think I need to name my favourite. Well, I'm really amazed that we've made it to three hundred pages on this thread. I didn't expect to fulfill our limit when I created it. Hurrah! Today's SW :):):):):):):):):)N shall be for Mandos in honour of this fateful event. Yep, once again laughing at Varden's blonde hair. I was looking at the "old" pics of him and was struck with the difference once more. I knew you would approve of my sig pic choice. MithLuin, I am certain your wall will look awesome and does even now - way better than mine with no sword. "The Sons of Fëanor Fanclub and Other Silmarillion Swooning." sounds great! So, it's agreed then?! It is as awesome a feeling to me as well that such a "crazy" notion as swooning for characters we have only artwork to go by and our own mental images and who could be considered to be players in a story too serious to put in the same sentence as swooning, did work and we are starting a second thread for the same notion and wish. Wow! SW NNN!!! for the whole cast of Silmarillion, especially Maedhros because I finished the series where one of the characters gets hung by a wrist from a battlement.